Urban Adamah is “a community organic farm and Jewish environmental education center located in Berkeley, CA” and “integrates urban organic farming, direct social justice work and progressive Jewish living and learning.” The farm scheduled a ritual kosher slaughter workshop to take place on Sunday, May 3rd. The hens who were to be murdered were only two years young. The reason why the hens were to be killed? They were not producing as many eggs as the farm would have liked! “Slaughtering these hens simply because they no longer lay enough eggs is an insult to the females of any species. Two-year-old hens are young and healthy, and there is no justification at all for the community center to kill them, especially when loving homes are waiting. Rather, the community center should gratefully grant these hens the love, compassion, and justice it movingly proclaims.” — Karen Davis, president of United Poultry Concerns. We regret to inform you that we are canceling our shechita (ritual chicken killing) workshop planned for this Sunday. Our landlord has asked us to cancel the event. We do not have explicit permission in our lease for this activity. It has also become clear that there is a significant protest being organized outside the farm during the workshop. 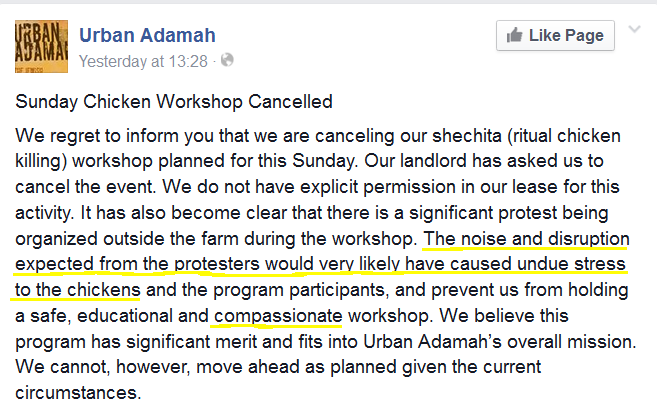 The noise and disruption expected from the protesters would very likely have caused undue stress to the chickens and the program participants, and prevent us from holding a safe, educational and compassionate workshop. We believe this program has significant merit and fits into Urban Adamah’s overall mission. We cannot, however, move ahead as planned given the current circumstances. So protestors would cause your chickens undue stress, but a mass killing wouldn’t cause undue stress? Do they think the chickens would have remained calm during the mass murder? I find it incredibly hard to believe that UA genuinely thinks that animals remain stress-free while they are being killed. And if the welfare of your animals is ultimately so important to you, then why do you want to kill them at all? Especially in light of the fact that sanctuaries have offered to take the hens and let them live out their natural lives! So glad this workshop was cancelled. United Poultry Concerns is urging Urban Adamah to allow the 15 young, healthy hens to go to the Bay Area sanctuaries that have offered to adopt them for the rest of their lives. This is an opportunity for the community center, whose spokespersons talk cloyingly about “respect” and “compassion” for the hens in the same breath as hunger for slaughtering them, to show true compassion and respect for the birds. Instead, they are refusing to let the hens go to sanctuaries. Degradation and cheapening of words like “compassion” and “respect” parallel the degradation and cheapening of the lives of the birds. These words mean nothing under such circumstances. They are a mask for attitudes and desires that are their opposites. Give a Cluck – Go Vegan. Well the landlord probably offered them a choice between being evicted or canceling the slaughter. I was a landlord myself at one time and was always concerned about what my tenants might be trying to get away with beyond “normal use”. My fear is that they will slaughter the hens anyway come hell or high water, just out spite ,like the Danish zoo that slaughtered a baby giraffe. It does, at times seem to me that people really can be possessed by demons.